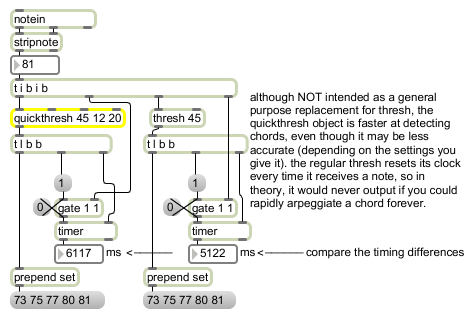 quickthresh is a faster, low-latency, thresh-like object - optimized for chord detection. base-thresh 'fudge' and thresh-extension times (milliseconds) int or float opt Three numerical arguments can be given to "fine tune" the timing thresholds to suit your musical needs. The first argument is the base thresh time in milliseconds; all notes received within this time period are collected into a list. The second argument is the "fudge" time in milliseconds - if any notes are played within this amount of time at the end of the base thresh time, the threshold is extended. The third argument is the thresh extension time in milliseconds. This is an additional time frame added to the first argument, if necessary, in order to capture additional notes (due to sloppy playing) into the list. By default the three arguments are set to 40, 10 and 20, respectively. bang A bang will reset quickthresh and output the notes in its buffer. In left inlet: The incoming values which appear within a certain time threshold are stored and output as a list. See the arguments' descriptions to learn how the time thresholding works. In second inlet: Sets the millisecond value for the base thresh time. All values received in the left inlet within this time period are collected into a list. In third inlet: Sets the "fudge" time in milliseconds. If there are any incoming values within this amount of time at the end of the base thresh time, the threshold is extended to allow more values to be added to the list. In fourth inlet: Sets the threshold extension in milliseconds. This is an extension of the base thresh time, which is used if values arrive in the object's inlet in the "fudge" time zone. The word set, followed by three millisecond values, can be used to set the three threshold parameter values (base thresh time, "fudge" time and thresh extension). float: When quickthresh has used up its threshold time, any incoming values that were played within the time threshold are output as a list.